World Cup Bookies Club. Day 24. 12:00 PM EST: Argentina vs Belgium @ Estádio Nacional de Brasilia, Brasília. I want an upset! 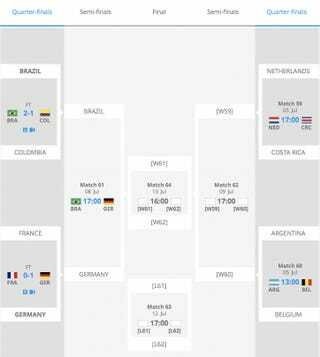 So I'm tipping my hat over to Belgium, even though I know Messi will win it for Argentina one minute before the match ends. 4:00 PM EST: Netherlands vs Costa Rica @ Arena Fonte Nova, Salvador. As much as I want Costa Rica to win this match, I know Netherlands are the favorites for this match. The Oranje will show once again their tactical nous when their situation is dire.